DIY: DulceCandy87 Nail Polish Rack! We were on YouTube recently watching videos and came across DulceCandy87's video for a DIY nail polish rack and just had to try it! The normal acrylic racks sold online typically only hold somewhere between 60 and 120 and are just WAYYYYY too expensive! We'd seen all of the videos using foam board and that just did not seem sturdy enough. So this was PERFECT for us! To see how to make this check out Dulce's video and/or blog! Let us know if you guys try this and tweet/facebook us the pics!!!! Now you need to make another one... looks like you are full LOL. I'm going to figure out how to shrink this... I am sooo not anywhere near this collection! what material did you use? did you use the same Dulce did? So awesome! I love it! Bex & Lauren122 Thanks for giving me an approximate! I have 140 (crazy :|) in my collection currently so I am glad to know I will have room for more! Though seeing I have room will probably make me go out to buy more to fill it up :$ .. what can I say, I am addicted! 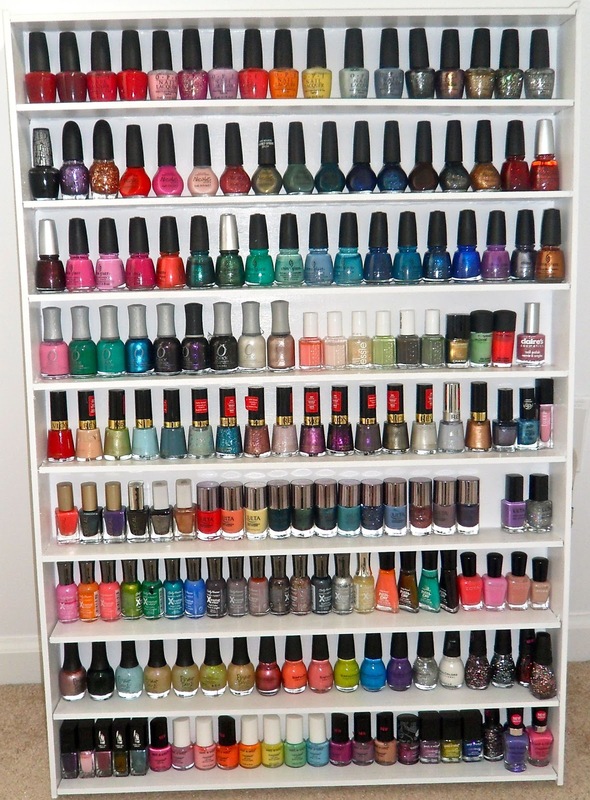 When my collection gets a little bigger I'm doing this! Does anyone know if this is standing up on its own, or if its anchored to the wall. I know in Dulce's video it's hanging, but she doesn't explain how she did that part. WOW LOL i counted all your nail polishes and now i forgot exactly how many but you had 175 or something like that wow girls. I never really collected lots of nail polishes b/c mine would always dry before i finishes the whole bottle but lately i have been buying tons of nail polishes and have been collecting them but i really do not want them to dry out. Does yours dry out on you??? You have alot so i want to ask someone who has alot of them and collects them if yours end up drying up on you. I Really like Dulucecandy87 videos i watched this when she first did this and i have been thinking about making it b/c this is a sturdy one and all the other ones on Youtube were made of foam and stuff. Was it pretty easy to make? i need to make one of these. i made a foam board one but like u said it's not very sturdy.